Double Barrel Keg Hand Truck-Will Work with all Sizes and Multiple Kegs! 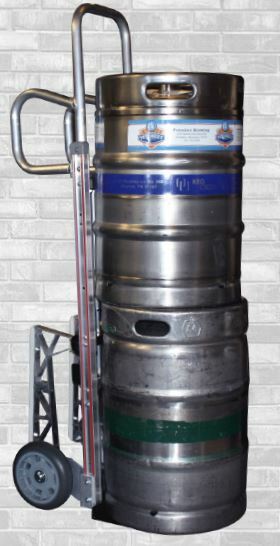 The New B5MK sliding keg hand truck, is taking the beer industry by storm! 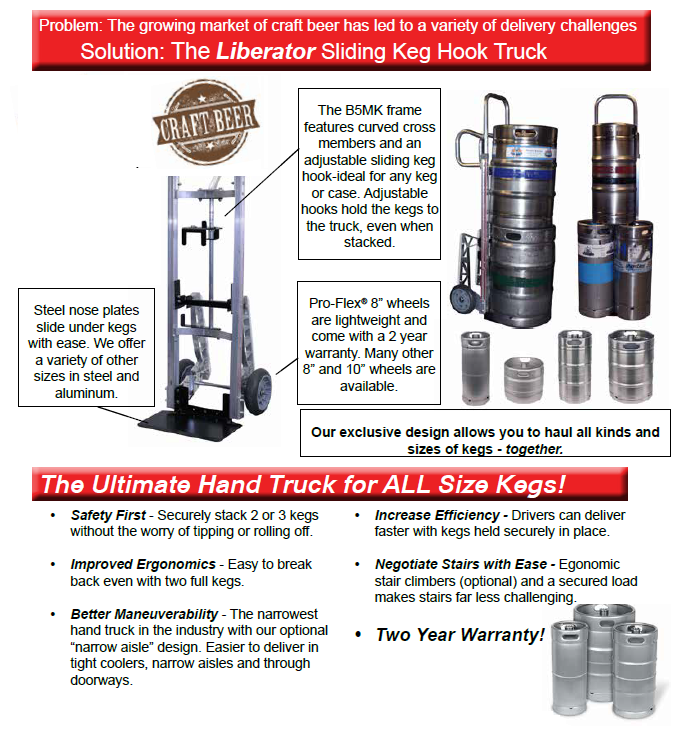 It's ingenious design will allow you to move every size keg as well as multiple barrels simultaneously. The B5MK frame features curved cross members and an adjustable sliding keg hook— ideal for any size keg or case. The hook and tab (for the top keg) on the adjustable arm hold the kegs to the truck even when stacked. • Two 1/6 barrel kegs on the bottom (utilizing the unique double hook) and one 1/6 barrel or 1/4 slim barrel keg on top. • One 1/4 slim barrel keg on bottom and one 1/4 slim barrel or 1/6 barrel keg on top. • One 1/6 barrel keg on bottom and one 1/6 barrel keg on top. • One 1/2 barrel keg on bottom and one 1/2 barrel keg on top. • Steel 18" wide x 7.5" deep toeplate will slide under kegs with ease. • D16 Pro-Flex 8” wheels are lightweight and come with a 2 year manufacturer warranty. Check out the Design Your Own option here.